About a year ago, the confluence of a brand new laptop computer and a workshop on social media by photographer Don Giannatti caused me to start tweeting. Now, for those who know me as a person who is phobic about all things technological, you might be surprised to hear of my involvement in Twitter. Don literally (practically) forced me to sign up and give it a go. So, I started. I got involved with a group of 32 artists doing an art postcard exchange. I made 32 unique postcards and sent them out. In return, I got wonderful postcards from people all over the US, UK, Canada and Australia. I'm still in touch with a few of them. A Twitter book club, started by Alyson Stanfield, got me caught up in the recent autobiography on William deKooning at about the same time. Last but not least, I met my friend Pat. It started with a tweet from Pat, after I'd posted the news of my solo show at the Burton Barr Central Library last September. She told me she's an artist in Phoenix and would come to my opening. And guess what? She did, along with her husband Jacob. We hit it off right away. And began to communicate via email. I introduced Pat to my good friend Carole Hanks, another Phoenix artist. They became friends. They came down to visit me in Oracle. We've had lunch at a half-way point between Phoenix and Oracle. Jim and I have had dinner at Pat's home. They've had dinner here. Pat and I either talk on the phone or send emails on a regular basis. In short, we've become good friends. And now, I'm in a solo show at the Willo North Gallery, all thanks to Patricia Sahertian! That's another whole story. 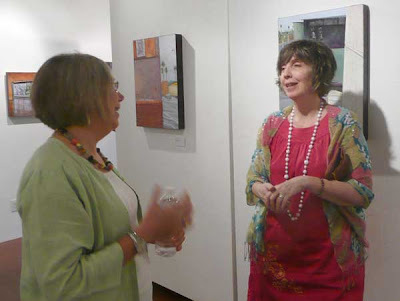 Here we are, talking, talking, talking at the first First Friday at the gallery. And am I still tweeting? Well, no, Don, I'm not. But maybe I should start again. So many good things came of it. Glad you got the postcard. I'm not sure which I'm more dubious about–email or mail going via snail mail. It's reassuring to know that at least some of the cards have made it to their destinations! Thanks for your good wishes!